Now in its tenth year, the Bulletin’s annual student profiles have become something of a tradition. Faced each spring with a mountain of potential candidates, we puzzle our way through a dizzying array of experiences and achievements to select a handful of students who will approximate the breadth and depth of the HBS community. There’s no way to give a complete sense of that diversity, of course, or to tell each and every remarkable story — but we hope you will enjoy meeting the students as much as we did. As these students and their 875 classmates bid one another farewell, bound for every corner of the globe, they mark the completion of a degree and the beginning of a new relationship with one another and the School. (“It’s sad that we can’t all go to work for the same company,” one graduate remarked ruefully.) Yet the vigorous health of the HBS network (and Class Notes) stand as an ongoing testament that the connections formed at Soldiers Field won’t be broken by time or distance. Les Williams readily admits he’s a bundle of contradictions. There’s Williams the cerebral, quantitative guy. And there’s Williams the extroverted, creative guy. Since high school, he’s paid homage to both — becoming an engineer who also loves to act in community theater. Still, the question loomed: Could his seemingly opposite sides be united in a common career goal? As a youngster growing up near historic Mount Vernon, Virginia, he dreamed of becoming an engineer, a course he pursued at the University of Virginia. He now jokes about how he “moonlighted” as an engineering student while pursuing his passion for the theater and community service. Revelation turned to reality a month later during a campus talk by Ann Fudge (MBA ’77), chairman and CEO of Young & Rubicam Brands, when she unexpectedly offered Williams an ad agency internship at the conclusion of his first year. Building on that 2004 summer experience, he’s headed for an advertising job in New York City upon graduation. Finally, his dueling right-brain/left-brain days appear to be over. A native of Severodvinsk, Russia, Natalia Mlotok has witnessed the stark effects of perestroika, Mikhail Gorbachev’s program of economic, political, and social restructuring. Located on the White Sea in northern Russia, Mlotok’s hometown was built on the manufacture and repair of nuclear submarines. Two government factories employed a majority of the city’s 300,000 inhabitants (including Mlotok’s parents) until market reforms obliterated the industry, leaving thousands penniless. “The mid-1990s were the worst time,” recalls Mlotok, who at that point was studying on a government scholarship at St. Petersburg State University of Economics and Finance. To cover expenses and support her parents she worked first as a Mary Kay sales rep-resentative, then as an investment analyst, running to the office after classes and staying well into the night. Determined to acquire the skills needed to help rebuild the Russian economy, Mlotok entered an annual case competition sponsored by McKinsey; of the thousands of applications received, she was one of twenty finalists, and one of two offered a full-time position. Hoping to build on her work experience, she applied to business school. When she visited HBS as a prospective student in 2002, it was her first trip to the United States. When serendipity knocks, Julian Flannery isn’t afraid to answer. In fact, he’s made a habit of thriving on the unexpected. As an economics graduate from Duke University, he was just three days away from launching a Wall Street career when the phone rang. Marilyn Quayle, the mother of a varsity lacrosse teammate, called to ask Flannery to be chief aide to her husband, former Vice President Dan Quayle, as he mounted an exploratory campaign for the Republican presidential nomination in 2000. Forty-eight states, half a million miles, and a year later, Quayle dropped out, and Flannery moved on — with no regrets. “It was a fantastic experience,” he says. After a brief stint with an ill-fated Internet venture, Flannery considered making another run at Wall Street. Instead, he decided his public-service chapter wasn’t finished. He landed a government agency position, which led to a series of advancements, culminating in serving as special assistant to White House Chief of Staff Andrew Card. Through it all, he came to understand two fundamental things about himself: “One, I am hardwired to run something and make things happen through people. 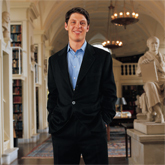 And two, I wanted to lead with purpose.” That’s when he decided to apply to HBS. In the short run, Flannery plans to ply his newly acquired skills in the world of private equity. But eventually, he confesses an interest in public service. Reflecting on his experience in Washington, he notes that “there is tremendous honor in being a public servant, and bringing business skills to the public sector is critical.” In the meantime, if serendipity comes knocking again, Flannery knows just what to do. For Krishna Mahesh, the completion of his HBS degree marks a final step toward a long-held dream: to return to India and join the TVS Group, an umbrella for 32 holding companies that represents the country’s largest supplier of automotive parts. The $1.5 billion business was started by Mahesh’s great-grandfather in 1911; Mahesh, as a member of the fourth generation and recipient of an engineering degree from Stanford, cites the importance of remaining true to the family culture while bringing something new to the table. “I’ve been living in the United States for eleven years now,” says Mahesh, who has worked at McKinsey in Cleveland as well as a Toyota plant in Kentucky. “My biggest immediate challenge when I return to India will be finding the cultural fit again.” Having worked summer jobs as a teenager in a TVS service station and aluminum foundry, he has a good basis for rebuilding that familiarity. When Jenny Abramson arrived at Stanford from a “progressive” high school in Washington, D.C., she was concerned about the large size of her classes. Seeing an opportunity to bring this up with then–Stanford President Gerhard Casper after he had addressed the student senate, she called after him down the hall. “Since we always had addressed our principal by his first name, I blurted out, ‘Gerhard, we need to reduce the class sizes here,’ ” she recalls with a smile. Health care, education, and politics have long been of interest to Abramson. After she graduated Phi Beta Kappa from Stanford, a Fulbright Scholarship took her to the London School of Economics to study the implications of the Human Genome Project. While an associate at BCG in New York, she created a college preparation program for inner-city youth. Eager to apply her analytical skills to the social sector, she returned to Washington as director of program strategy and development at Teach For America. At HBS, Abramson has left her mark on a range of activities, from serving on the University Committee on Rights & Responsibilities to her role as copresident of the Business of Sports Club. 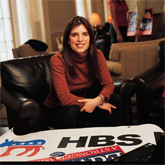 But she’s most proud of the role she played in revitalizing the HBS Democrats Club, which grew from fewer than 30 to over 200 paid members under her guidance as copresident.